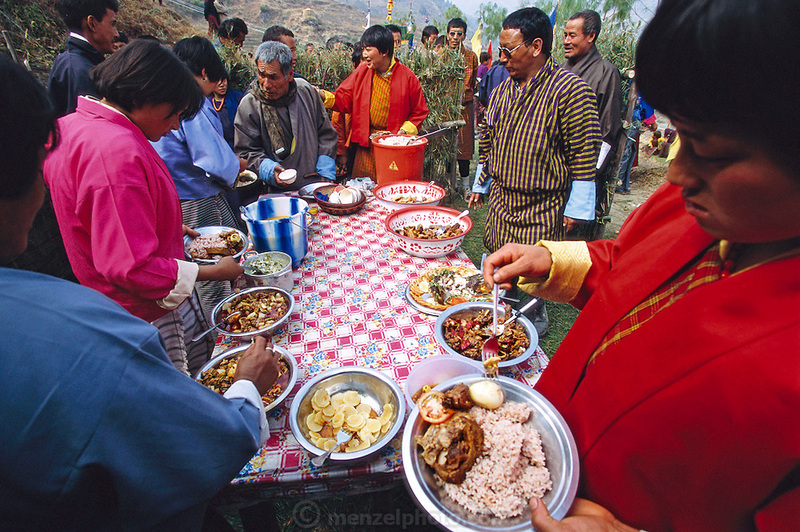 During a celebration of the first electricity to come to this region of Bhutan, visiting dignitaries join village member Namgay (at the head of the table) at a buffet of red rice, potatoes, tomatoes, cucumbers, beef, chicken, and a spicy cheese and chili pepper soup. The villagers have been stockpiling food for the event. (Supporting image from the project Hungry Planet: What the World Eats.) The Namgay family living in the remote mountain village of Shingkhey, Bhutan, is one of the thirty families featured, with a weeks' worth of food, in the book Hungry Planet: What the World Eats.